Unlocking the Tmobile G1 phone – Jane Talks Tech! TL;DR – Pay less than $20 to have an unlock code for your phone from Unlocking.com! So, I got an Android phone, specifically, the T-Mobile G1. Yes, it’s no longer officially supported by T-Mobile and second, I’m with AT & T! However, the person I purchased the device from had done the hardwork in rooting the G1 and flashing the CyanogenMod ROM v. 5 onto the G1. See this excellent XDA forum post on why you should root your G1. Due to some mixed signals, I was under the impression the phone was unlocked. Alas, I was to discover that a Rooted G1 does NOT an Unlocked G1 make. After I got the G1 phone, I giddily popped my ATT SIM and got this dialog box: “SIM network unlock PIN”. You’ve instituted a PIN lock for your SIM to prevent unauthorized usage. You’ve forgotten the PIN for your SIM and with only 3 tries to get it right, it doesn’t take long for you to get ‘locked’ out of your SIM/Device. Enter the PUK (or PUK2) codes. 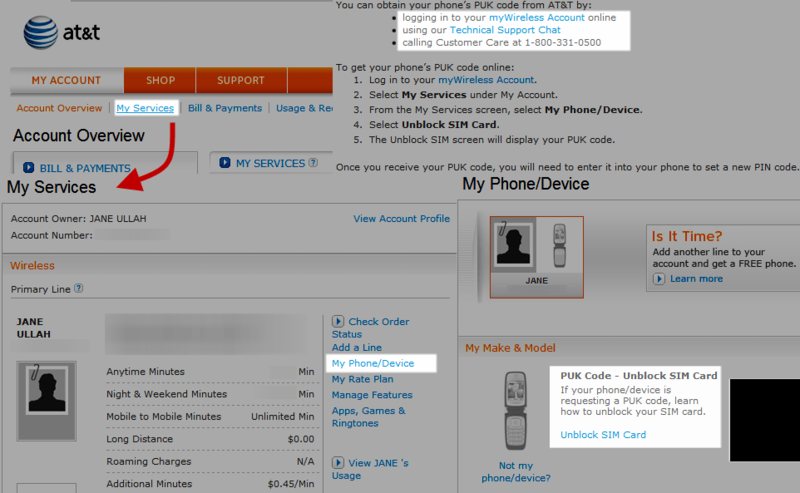 PUK stands for PIN Unlock Key and if you’re an ATT customer, you can get it by going logging into your MyWireless account. Navigating to the “My Account” tab and selecting “My Services”. From that screen, you can select your device and there’ll be a link that says “Unblock SIM card”. Clicking that will open up a new window that displays your PUK code. If you haven’t followed my cellphone history, I went from owning a Palm Treo 650 to a Nokia E71x to an ATT Tilt and now, the G1. The Android system is completely new to me while I knew there were more complicated ways of unlocking the G1 (a.k.a. HTC Dream) for free, I wanted to get over this really big obstacle quickly & without bricking my phone. I then decided to pay money to get my new phone unlocked. There are *several* sites that claim to be the best and guarantee all sorts of things. However, a big caveat with many of these sites (overkill in my opinion, but that’s why I’m writing this article to keep you informed) is that getting your money back isn’t a simple matter of “the unlock code didn’t work”. You actually have to prove that it didn’t work! For instance, I’ll pick on the site I went with: Unlocking.com. The choice was easy i.e. they had an average of 4 stars from over 400 reviews which isn’t anything to sneeze at. The information provided on the submission form when ordering the service is 100% correct (agreed). The instructions provided with the service have been followed exactly as stipulated (agreed). The target mobile phone is not stolen or blacklisted (on the fence because I purchased the phone off Craigslist and I don’t believe my phone was stolen or blacklisted. It might help if they provided a way to get off such a blacklist in case my phone had been wrongly labelled). The target mobile phone is not already unlocked (agreed). The software of the target phone has never been altered, changed or tampered with in any way (agreed and I took a chance anyway on using their service on a rooted G1. Your mileage may vary and the sheer fact that I attempted to unlock a rooted G1 is grounds for rejection of any requests for my money back). The IMEI number of the target phone has never been altered, changed or tampered with in any way (agreed This particular item (IMEI number) appears to be the critical element of ensuring the unlocking codes work). The phone has never undergone an attempted unlocking with codes in the past (on the fence Does it matter if these previous unlocking attempts happened with their service?). Even if you meet all those conditions above, Unlocking.com reserves the right to request evidence and by that, they mean, either mailing your device to them or providing video evidence of you following the instructions! I don’t begrudge them for taking such extreme measures, but I sure would like to know before the fact that I should’ve filmed myself following the instructions. That said, the proof of the pudding is in the eating and Unlocking.com delivered on the primary purpose of their existence: providing valid unlock codes to hundreds of devices. They take credit card fraud seriously. It wasn’t a simple matter of plugging in my credit card information and getting the codes. I had to verify my phone number and authenticate with a PIN that was provided. Only then did my order status change to “verified” and according to the email I received, they quoted 25 minutes to generate the code for my handset. In reality, the entire process was less than 15 minutes to get the unlock codes. Their instructions for entering the unlock code are simple and very clear about the need for accuracy during your order. In fact, they offer you the chance to correct an order if you’ve realized almost instantly that you mistyped the IMEI number. On the first try, the unlock code they issued for my G1 worked. Thus, I heartily recommend you use Unlocking.com for the specific task of unlocking your G1! As of 07/26/2010, the service costs $19.99 so it’s a small price to pay in the scheme of things. 🙂 If things go south, make sure you haven’t run afoul of their dealbreaking issues and that you filmed the unlocking procedure as you did it (which I did). Follow the instructions on Unlocking.com to the letter and you might not need a refund. Read the tems & conditions and specifically, what hoops you have to jump through in case you need a refund.